I’ve been meaning to check Plantation Coffee Roasters out for pretty much the entire 2.5 months they’ve been open. And today was our lucky day. A trip to West End for breakfast, and 15 minutes spare on our parking meter was a perfect window to jump through to check out this new addition to West End’s specialty coffee scene. Shaf started out roasting as a wholesaler with accounts like Shucked, I reviewed a Costa Rican he roasted and it was one of my favourite coffees in 2011, he’s no longer supplying Shucked, but he’s using that experience to eke out his spot in West End, his clean little space has already drummed up a community of committed locals. The house blend is an improved version of his original Shucked blend, with the benefit of significant time refining his palette, and the blend’s dynamic. The result is, not surprisingly, refined. There’s a really nice balance, it rolls around the tongue and slides down the throat like silk. Shaf is pulling shots on a shiny La Marzocco, and offering the blend plus a rotating single origin (he’s recently featured that Costa Rican. There’s a cake cabinet filled with delicious looking bits of baked goodery, and a relatively comfortable space to hang out and watch life unfold on West End’s Boundary Street – it’s located at number 140 Boundary Street. Do you believe in love at first sight? Then The Single Guys might be for you. It’s a pretty deer place. The Single Guys is pretty much what you get when you mix a passion for quality, small lot, passionately roasted fine coffee, a no-fuss aesthetic, the experience of co-operating one of the best cafes in Brisbane, and the lessons one learns from strong connections to other successful people in the coffee scene. That’s the recipe for the kind of dating profile that scores you a second date in the world of online romance – or the specialty coffee merry-go-round. Ben Graham is one of the men behind The Single Guys – and you’ll probably find him behind the machine, a shiny La Marzocoo, pouring shots using beans he has sourced, blended, and roasted. Ben was one of the men behind One Drop, still capably producing delicious coffee in Fortitude Valley – which for a long time rated as my wife’s favourite coffee stop. He’s also a big fan of Dandelion and Driftwood and like many other people in the Brisbane industry seems to have benefited from both observing and conversing with team Wolff. Suburban coffee is where it’s at. And if you want to wow a crowd – and the crowd gathered in the Single Guys Kenmore spot after just two weeks is testimony to this – you’ve got to deliver an experience. From coffee, to fit out, to the simple, but tasty, breakfast menu – The Single Guys is an experience to travel for – there are plenty of car parks handy, both a small lot in front of the store, and in the shopping centre and gym car parks on either side of the corner block. I loved it. It’s a big contender for number one slot on my top 10 for 2013 and it’s only the 14th of January. I’ll have to keep going back just to make sure I don’t forget how good this first experience was. It helps that Ben and his staff are just lovely people, and the customer service was excellent. There really wasn’t anything to complain about. I had a flat white on the house blend (it was so good I bought a bag of beans to take home), and a ‘spro on the featured Costa Rican single origin (where the name comes from, I’d guess). The shot came after my tasty bacon and egg breakfast burger with a zippy relish, so I couldn’t quite split the flavour of the delicious breakfast from the smooth espresso, but it clearly wasn’t bitter or stringent, because it went down a treat. My flat white and Robyn’s picolo were just sensational. The first sip had us both making happy noises – the blend, which Ben said may contain traces of peanuts (flavour – not actual nuts), delivered a smooth, creamy and delicious coffee experience. It was so nicely balanced, in my humble opinion, and had a charming butterscotchy sort of caramel sweetness and a little bit of a fruity taste towards the finish. It’s a great coffee for milky drinks. The Single Guys is open 7 days, across the road from the Kenmore Village Shopping centre on Moggil Road. You can, and should, hit them up on Facebook. If I’m meeting anybody in West End, that’s where I go (even if a megafranchise has tried to coin the idea that you meet somewhere that has horribly overroasted coffee). But the problem with Cup at West End is that it’s so popular that sometimes seating (and parking nearby) isn’t so readily available. This is the price you pay for consistently serving up amazing coffee, both the changing (based on season, taste, and goodness), but consistently grand Five Star Day blend, and a range of single origin delights. Produced on some of Brisbane’s nicest coffee kit, or served up as meticulously prepared filter coffee. It’s easy to see why Cup is popular. They’ve been picking up some pretty nice little cafe accounts too – including Blackboard Specialty Coffee on the Gold Coast, The Little Prince in Woolloongabba, and the Rogue Rennard in Paddington. The lack of space, and the amount of roasting that must be required to service these classy outlets, has produced something beautiful. 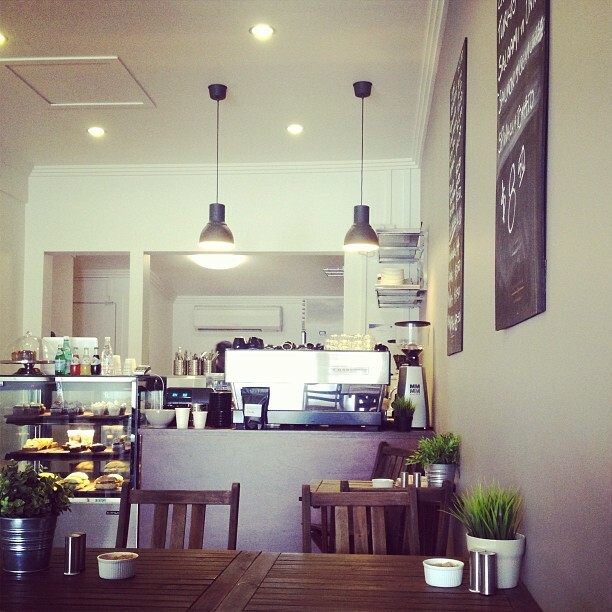 A new roastery/cafe in Woolloongabba. As I was driving home from this new warehouse space today I was thinking that with Cup, Grindhouse, and Uncle Joe’s on my route to or from the city there’s a nice little coffee crawl itinerary just waiting for a lazy Saturday morning. I’m feeling a little bit spoilt for choice in my corner of Brisbane’s south side at the moment. My Brisbane top ten is going to be even harder to come up with this year, especially given I haven’t even managed to get to some of my old favourites. I mentioned the “cafe as fourth place” thing in my review of Reverends the other day, and in my opinion, Cup’s new warehouse has nailed it. It’s big. Open. And is, as far as I know, the only cafe in Brisbane boasting both a Slayer and a Mistral on their benches (I want to say “in the world”). While it’s the new home of Cup’s roasting operations, there’s also a nice Coffee menu on offer (Josh, the owner and genius behind Cup, says there’ll be very limited food in the future). And did I mention there’s space. And seats. And tables. And music. And coffee. I’m a big fan of Cup’s aesthetic – from font choice, to the black/timber fitout at this place, to the big roasting robot painted on the wall in West End, to the choice of some of the most beautiful and technologically amazing machines available – so I like this place a lot. The machines and the roaster are the visual heroes. The coffee is the real hero (and according to latte art smackdowns, and the recent Queensland Barista Championships – they still boast Brisbane’s best latte artists). Everything else is functional and understated. Like it should be. It’s still in the very early days. But I like it. Very much. You can buy their beans online too. (there’ll be a map here one day – but for now, the roastery is tucked into 43 Balaclava St, Wooloongabba). We’ve been driving past the old Red Rooster on Cavendish Road for about six months with the knowledge that it was slated to become a pretty special cafe. Brisbane, let me introduce you to the newest addition to our specialty coffee scene. Uncle Joe’s Coffee House. It’s pretty close to where we live so I’m very excited about the prospect of these guys opening on Saturdays (coming soon), and serving food that matches the quality of the coffee (also coming soon). Adam, who was flying solo today because his business partner had a bit of a breakdown en route to work, is one of the nicest coffee people I’ve met. And coffee people, because caffeine is pumping through their veins, are generally some of the nicest people in the world anyway. 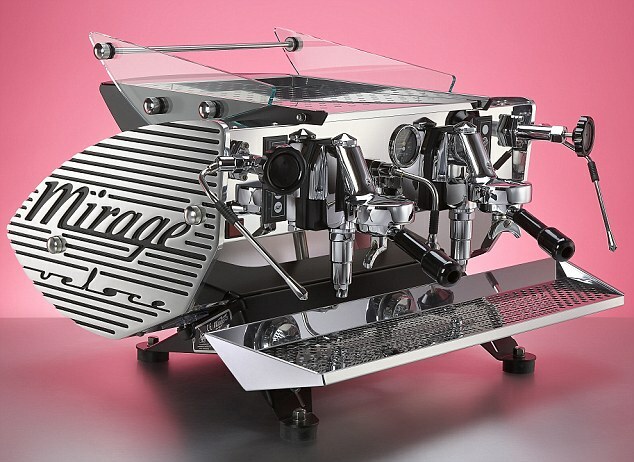 He was busy, single handedly manning the beautiful and heavily customised Kees Van Der Western Mirage – it’s got longer than usual pre-infusion and enhanced temperature stability. Adam’s excitement about that was enough to mark him out as a guy with industry experience that is matched by the type of passion that keeps you getting up for an early morning commute from the Gold Coast to your brand new Brisbane cafe… for a 7am start. He weighs his shots and does other hallmark coffee geekery stuff to make sure the coffee is pouring sweetly and without too much cluttering bitterness or cloying roast-produced body. These guys are committed to getting the best shots out of the best beans. And I love that. Here’s a Mirage in all its glory… just so you can see how special they look. And here’s Uncle Joe’s Mirage in the wild. The Supafly Blend isn’t named for the famous Joe Cartoon character – more for Adam’s reaction to tasting it once the decision was made to include the Rwanda Mig Maraba that rounds out the blend. The guys are committed to sourcing sensational beans from around the world, roasting them through their 3rd Crack Coffee Brokerage (and selling them green for keen home roasters like me). The fitout was nice, full of earthy tones, nothing too cold, and full of bits and pieces of carefully chosen coffee paraphernalia. The coffees were remarkably good. The blend was well balanced and delicious in milk, the Guatemalan was roasted light, just how I like it, so the characteristic sweetness wasn’t drowned out in a see of body and roastiness. And the coffees – as the sign says – were served at around 65 degrees. Perfect. They’re also starting up a brew bar in the next few weeks, and Adam whipped us up a delicious Aeropress today on the sensational Guatemalan Santa Felisha that’s their current Single Origin (it was delicious in milk, outstanding as an espresso, and mind blowing as an Aeropress – Adam gave us a timer so we could track the changes in the flavour profile as it cooled, he said the 15 minute mark was the sweet spot – so we waited. And he was right. The Aeropress coffee goes into the funky pouring kettle. I’m thrilled to have a cafe producing this sort of coffee sourced from around the world by a world class sensory judge – Joe Hsu from Osir in Taiwan, who the cafe is named after – and blind tasted so us consumers are getting coffee that tastes good, not coffee sold on reputation alone. They’re still waiting on some top quality, high brow, porcelain cups – so they’re serving dine in coffees of all varieties in glassware at the moment – but this will be my local (alongside Grindhouse and Dramanti obviously). Definitely check this place out. 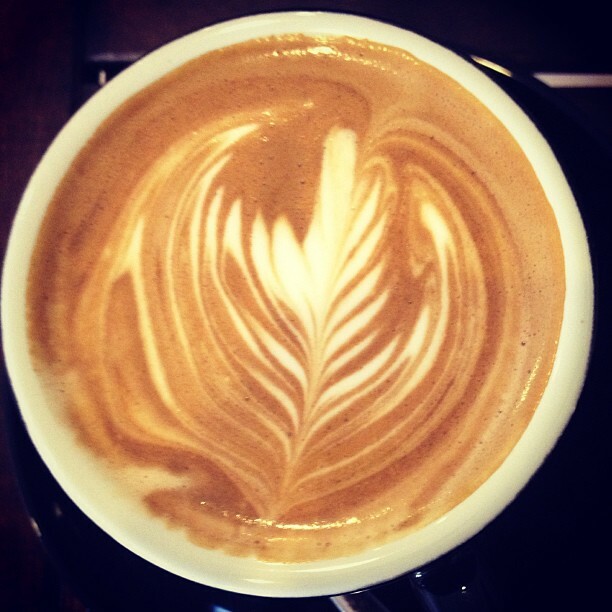 Add it to your coffee crawl itineraries. This was one of the best first time experiences I’ve ever had at a cafe, and I’ve been to lots. They’re only going to get better too as the fitout is finished, and the menu expanded. I seriously can’t think of a negative thing to say, even the music was good. Oh wait. Parking appears difficult. We parked out the back because we didn’t see the “tenant parking only” sign. There you go. But there’s a supermarket with plenty of space across the road, and the Coorparoo market next door, which also has heaps of parking. And people were just rocking up and parking out the front while we were there – so that’s not even really a negative. They’ll be selling Aeropress kits with Able Disks and these funky kettles soon. You can hit up Uncle Joe’s Cafe on Facebook, Twitter, and Instagram. If Iron Man’s Tony Stark owned a cafe it would look and feel a lot like Blue Sky Coffee. The place is cool. It’s an open plan warehouse fitted out with all the bells and whistles – and to my knowledge is the only cafe in Brisbane fitted out with a three group lever machine. Some would say having three machines running behind the counter is excessive. But excess seems to be the name of the game here, and that’s not a bad thing. As if to reinforce the Iron Man feel – the movie is playing on the big screen mounted on the wall, I assume this is intentional, if not it’s a happy coincidence. Red classic sports cars (the real deal, not toys) are scattered liberally around the warehouse. The roaster is tucked in the back corner. This place is a visual treat. And worth a stop for the ambience alone. I can imagine a lot of blokes feeling like they’ve found a spiritual home at this place. There’s even a suit of armour. By the door. Sporting Charlie Sheen’s face. According to local coffee lore, the owners of this place are doctors whose passion for home roasting spawned this little enterprise that now supplies beans to cafes around the city. This is home base. The coffee is a mixed bag – with the investment of time, energy, and cold hard cash that has gone into the setup you expect to be blown away. And I wasn’t. It wasn’t bad, in fact it was mostly good. But it wasn’t “write home about the experience” good. And it could have been. You can tell Blue Sky Coffee cares about the details. Everything in the shop says so – from the range of blends available through the week, to the range of items on the menu – including the quite palatable lever shot from the Athena Leva, and the flat white made on their limited range replica Venus Century. A stunning machine, made (as are the other two) by Victoria Arduino. First up we ordered our standard drinks, mine a double shot flat white, my wife’s a Piccolo. With breakfast pastries on the side. The attention to detail is evident even down to the choice of cup and saucer. And the delicious biscuit, which brought out a range of flavours in the coffee and made it almost impossible to distinguish what was coffee and what was biscuit. In a good way. Our food came quickly, our coffees slowly – service was hampered by the sole barista’s need to be serving, taking orders, taking payment, and preparing one of the other in house specialties – a Turkish coffee (the process pictured below) – single handedly (he eventually called in a little bit of assistance from the roastery). No mean feat. He was friendly, knowledgeable, and happy to chat about the machines. Plus he pulled off this pretty amazing triple rosetta. He mentioned, as he delivered this one, that they would eventually have a board of latte art options available for customers to choose from. Which is a fantastic idea that brings a pretty unique level of interactivity into the process. I loved the art in the place too – including this classic petrol bowser loaded with coffee beans. So the coffee… which according to the a-frame board in store was the “Green Caffeine” blend… My first double shot flat white was a little on the hot side, not excessively so, it was acceptable, and it was a little watery (though again, within the acceptable range of flat white standards). It was delicious with the biscuit, but a little bland without it. The initial flavour was a little bit bitter, not unpleasant, but not sweet. Not fruity. Not rich and mellow. Just dead centre. Balanced. The aftertaste was the real kicker. It was sweet and long. And mingled in a really nice way with the vanilla flavour of the biscuit. Don’t get me wrong. It was definitely at the “specialty coffee” end of the spectrum, and it’s a luxury having other options to compare it to within Brisbane. The lever shot was bright, and acidic, it was a bit hollow, body wise, but it was very drinkable. And fruity, though I’m not sure what sort. The Century flat white (the board advertises a “Century Latte” but I was allowed to choose my preferred option) was odd. And I blame the milk, the barista showed me the shot (and I grabbed a surreptitious smell of it) while he was making the coffee. And everything appeared in order. But sometimes milk just gets a sort of grassy stale funky taste, I’ve bought some that did similar things when steamed, and this had it. My wife’s description of the taste was a little less generous than mine, and you could ignore it enough for the drinking to not be entirely unpleasant. I decided the coffee smelt and tasted a little like Rum and Raisin, and at that point could ignore the funk. Just to be clear, I’m not blaming the barista, I’m not suggesting there was anything they could do about the taste, or that they should even be aware of it – it was, however, part of the experience. I’d go again (and I will) – but not because the coffee was any better than others in the neighbourhood, simply because I want to feel like Iron Man. You can order Blue Sky’s beans from their website (it’s flash – literally), follow them on Twitter, or like them on Facebook. Another day, another Synesso. That’s how it feels wandering around Brisbane’s specialty coffee institutions. Fifth Battery Roasters is one such institution. Part of the Brother Espresso family that has outlets around the city – Fifth Battery doesn’t disappoint. Plastic Soldiers line the counter, which feels appropriate given you’re sitting in what feels like a military hanger, albeit lined with colourful glass panes. It’s a nice space. Open and airy. It has a great little garden space out the back. It feels like you could ride the bike hanging behind the counter around inside the cafe. There’s that much space. Which is tops. The food isn’t expensive. You can see a menu here. It was tasty. I had the brioche toast with poached pears. The downside was that it took a little while to come out – my wife had just about finished her meal before mine arrived. But it was worth the wait. Just. The coffee is good without being spectacular. It’s incredibly well rounded. So well rounded it’s hard to describe a distinguishing feature. The milk didn’t help, most of the flavours the signature blend promises were lost. But in their place was a solid, nutty, cup that didn’t change much from start to finish, there was no bitterness, and the temperature was perfect. The single origin, a Guatemala Sierra Azul, as a piccolo, was tasty. A very front of mouth experience. It had a touch of brown sugar, a hint of buttery popcorn in the aftertaste, it was a little bit like a caramel popcorn where the sugar hasn’t dissolved completely so the flavours aren’t fully mixed. It was very mellow. And worth a try. So I bought a bag of the beans, so stay tuned for a review of those. I grabbed a bottle of their cold brew coffee too, which I’ve enjoyed at home. And they sell coffee bags for a gold coin donation – which is perfect if you’re looking to do a little bit of coffee inspired art and craft. Fifth Battery has a great aesthetic, the atmosphere is friendly and casual, the tunes were good. It’s everything you’d expect from a little gem tucked away in the back streets of Fortitude Valley. A worthy breakfast stop. Follow Fifth Battery on Twitter.